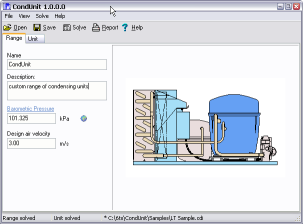 This program is ideal for the condensing unit equipment manufacturer. No need to guess the consequence of changing the coil size or compressor rating. You can specify the compressor, the refrigerant and the condenser coil. Enter an operating range and the program will build a table of performance figures. It allows range development and unit selection, taking into account actual operating conditions. The program incorporates line size and expansion valve selections.